As Alaska residents and visitors prepare to celebrate the Independence Day Weekend, the state’s wildland fire officials would like to remind the public to be extremely cautious with any activity that could ignite a wildfire. While this summer’s wildfire season has so far been relatively quiet in Alaska, there are areas of the state that remain very dry, specifically the eastern half of the state. As of Thursday, there have been 249 wildfires in Alaska that have burned an estimated 166,971 acres this season. There are 84 active fires but only five are currently being staffed with firefighting personnel. The remaining active fires are being monitored. The holiday weekend traditionally results in an increase in traffic in the woods and on rivers and roads as people head out to go boating, camping, fishing, hiking, off-road riding, and partake in other recreational activities. 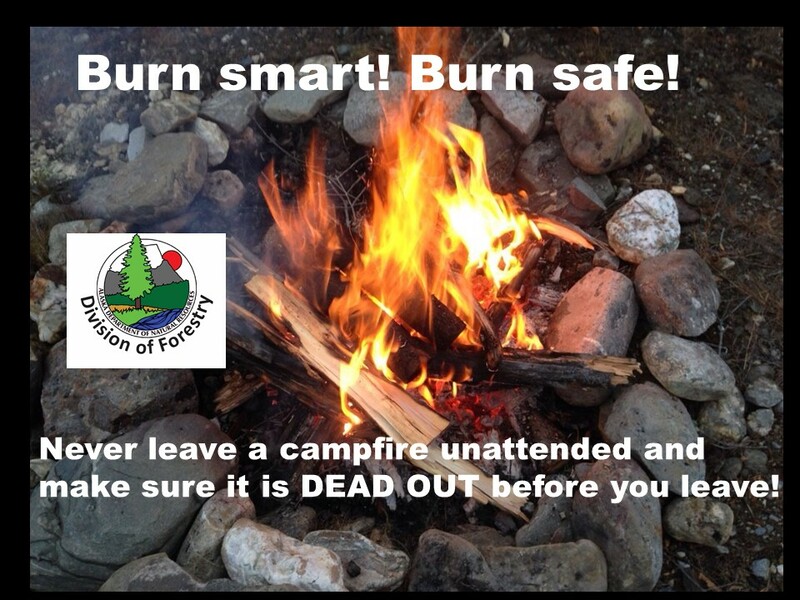 If you have a campfire, please make sure it is placed on dirt or gravel, keep it small, never leave it unattended and make sure it is completely extinguished before you leave by drowning it with water and stirring it until it is cold to the touch. Also, be sure to adhere to the Alaska Division of Forestry’s burn permit guidelines if you plan to do any kind of burning. Call your local forestry office or check online at https://dnr.alaska.gov/burn to make sure there are no burn suspensions in effect where you live. The use of fireworks is also a major wildfire safety concern over the Fourth of July weekend. If you plan to celebrate with fireworks, use them carefully and only where legal. Keep in mind, it is illegal to use fireworks on forested state lands, public or private, during fire season from April 1 to August 31. Check with your local government body to see what fireworks regulations apply where you live. Remember, you are responsible for every fire you start and anyone who starts a wildfire, even by accident, can be held accountable for suppression costs incurred by state or federal governments. For statewide fire information, visit the Alaska Interagency Coordination Center website at https://fire.ak.blm.gov and Alaska Wildland Fire Information at https://akfireinfo.com. You can also follow the Alaska Division of Forestry on Facebook at https://www.facebook.com/AK.Forestry and the BLM Alaska Fire Service at https://www.facebook.com/BLMAFS. For more information contact Alaska Division of Forestry public information officer Tim Mowry or BLM Alaska Fire Service public affairs officer Beth Ipsen at 907-356-5511.